SCHOOL POLICY: If a student receives a C or below on a semester grade, they are then on Arts Probation. Students can clear their probation status by attaining a grade of a B or above the next semester. If a student does not attain the C or above, the student is asked not to return to DSA the following semester. Students who are failing an academic class and/or dance at the time a field trip takes place may not be able to attend the field trip in order to remain at school and improve their grades. Process (Professionalism/Responses/Daily Assignments) and Product (Performances/Tests/Major Projects). In this section you will find information on what constitutes these categories, how you may lose points, and how you can make them up. Attendance is of vital importance to the safety, growth, and technical progress of every student. As dance educators we cannot measure their progress when they have not physically participated during class time. Aligning the dancer’s personal goals with the standards set forth by the DSA professional dance standards, is key to their success in the program. Every dancer in the department possesses the power to actively participate in their own personal growth as an artist. All teachers/Guest Artist will assign points per day, and will be approved by Education Director or the Artistic Director. Points can be deducted from the daily participation for the following reasons: for not following proper DSA dress code, poor class etiquette (i.e. excessive talking and horseplay), being late to class, working on other school work, refusal to listen to the teacher’s instruction, not applying corrections in a timely manner, not being respectful to the process (that also includes toward your teachers and fellow classmates), being disrespectful to guest artists (talking, being off task), a cell phone going off in class, and not being prepared for the work being done in class that day. Full participation in scheduled Dance Major classes to complete semester course expectations. Following DSA Dance Major Dress Code to maintain a neat, clean, and professional appearance. Following DSA professional dance class etiquette helps each dancer to receive all the building blocks you need to succeed, and it respects the process. Upholding all professional standards in dance and the arts in general. Reception and application of notes and teacher direction is key to enhance technique and artistic growth. Constructive criticism gives each dancer the tools they need to navigate their dance path. 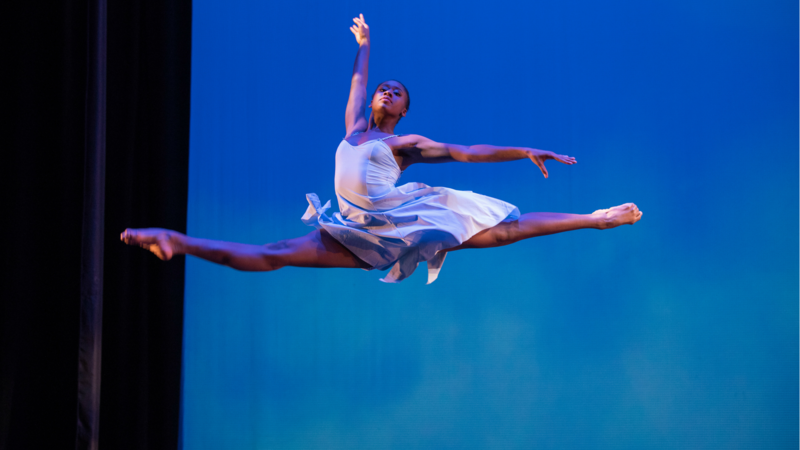 In alignment and preparation for college dance career expectations, each dancer has to study and take classes to maintain, refine, and stay connected to their technical base. The DSA Dance Majors will be placed on the pathway to success, recognize that every performance is a gift to yourself, the audience, and honors the art form they are passionate about and love so much. Showing up is half the battle won. Each class taken and full participation in rehearsals prepares our dancers for the stage. All the hard work and professionalism upheld in the studios enhances every performance. The performance is the payoff, and gives thanks to those that paved the way and made what we do as dancers possible. Dance Majors that can’t perform due to injury or sickness (family emergencies, i.e. funerals, etc. ), will be given responsibilities behind the scenes to help with the shows, which allows them to still earn the allotted points for the performances. Teacher Assistant responsibilities will be assign to those dancers that can’t perform to keep them connected and involved in the creative process. All non-performing dancers should use the moment of not performing as a tool to educate themselves on the behind the scenes work needed to produce a live dance performance. Each class that the injured dancer has to sit out, requires that dancer to use visional participation and detailed written notes to stay connected to the process. Progressive and preventative therapy is strongly suggested for a healthy & speedy recovery, and proper reentry into all dance classes and the rehearsal process. If a dancer has to sit out due to an injury, they will be required to write a paper about their injury. This will educate those dancers about their injury, aid them in knowing what they personally can do to recover, and gives them the knowledge of progressive and proactive physical therapy so they will be mentally and physically ready to return to dance. Be present during blackout dates. Blackout dates start one week before every concert. During blackout dates, it is mandatory for dancers to be in all scheduled rehearsals, final fittings, and make-up and hair classes. Final fittings are scheduled within the blackout weeks. Students missing rehearsals, fittings, and/or make-up and hair classes during the blackout dates will risk being TAKEN OUT OF THE PERFORMANCE and having their grades affected. The only exceptions are for emergencies. If students do not participate in the performance, their semester grade will be lowered by 10% (one full letter grade). Middle School Dance Majors: Fall Preview Days, Middle School Spring Dance Performance, Senior Projects Reviews, High School Spring Dance Concert Reviews, any professional dance concert reviews, and possible reflections when asked. High School Dance Majors: Gala Performance (11th& 12th 9th& 10th Graders), Fall Previews Days, Senior Projects Performance and Reflections, Middle School Spring Concert Reviews, any professional dance concert reviews, and possible reflections when asked. Each dancer is required to keep a journal with a dated entry for each class. You will turn in a journal summary every 8 weeks. Our primary focus in utilizing written work is to help with student critical thinking skills, to encourage self-reflection and awareness, educate and train a student’s aesthetic eye, provide a greater understanding of the dance production process & live performances, increase their knowledge and utilization of dance vocabulary, and provide an overall appreciation of the art of dance. We assume that students will treat their work with the same care that they do with their English papers; especially since this is expected in college no matter what the subject is. All Dance Majors will have the ability to share their art in not only the physical form, but also have the opportunity to discuss and share ideas in the written form, foster healthy conversations about dance, and allow our young artist the ability experience dance from another person’s perspective by using the proper written tools to do so. Reviews and Reflections give all dance majors the opportunity to express their point of view on viewing live performances, participating in live performances, and sharing about the process of participating in or creating dances. Reviews and Reflections will be a minimal of 1 page and typed. Dance Reviews/Reflections. These written components are just as important as the performances. They will be assigned to the particular concerts being seen. For example, if the department takes a field trip to see Colorado Ballet’s Dracula, students will be required to write a dance review on the performance. Students will be evaluated on their semester progress (1st and 2nd semester) and growth in all of their technique classes. Choreographic and improvisational elements may be assessed by the teachers of each particular technique class for that semester. Semester Reflections are required of every dance major for a complete final grade. Each technique class will have a practicum assessment. The students will be assessed in Ballet, Modern, and Jazz dance techniques. In addition, there will also be a self-evaluation component that the students score themselves. Having the ability to be proactive and have a voice in their own final grade is good for goal setting and realistic progress as they grown within the DSA program. The finals are each dancers’ opportunity to reflect on the course work they’ve done that semester, set future goals for one’s self as an artist, and an opportunity to look back on all their accomplishments in the studio and on the stage.